On a cool Friday night, a gentle autumn breeze fell on the Parisian skyline among the treelined boulevards picking up dry crumpled leaves in its path in small swirling eddies under elegant baroque spires and stone archways, as Parisians enjoyed a magical autumn night illuminated by the soft glowing yellow lights like a Lautrec painting. Their laughing moments and shadows captured in the night for eternity, pressed against the millions of other memories that have long faded over the generations, one pressed over the other. Lovers strolling across bridges over the Seine holding hands under the light of the iron and glass street lamps, the street mime artists performing on street corners to the sounds of the accordion, dinners filling the cafes with tables spilling out onto the street like a babbling conversation to the sound of Piaffe crackling from an old record player, as the young people swayed and jumped to the music of a visiting American heavy metal rock band. Then the innocence of the night was suddenly shattered by the spitting bullets flying from the AK-47's ripping flesh, sinews and bones; destroying hearts and lungs as the last gasps of breath left the lifeless forms of innocent Angels. The suicide bomb vests of the attackers blowing, shattering their bodies into chunks along with the surrounding Parisians and visiting lovers of this beautiful city. For Paris is in a away the symbolic apogee and culmination of the best of European civilization, the symbol of this ancient continent and this attack came from both forces within and outside of Europe. Homegrown Islamic terrorism and imported Islamic terrorism on behalf of that Satanic death cult called ISIS. The attack by ISIS is not only an attack against Europe itself, but also an attack against the religion of Islam and the Rivers of innocent refugees from Syria who are escaping this very same fundamentalism; for as Paris is the cultural and cosmopolitan Jewel in Europe's crown, so was the city of Damascus the cultural and cosmopolitan cultural city of the Middle East. Hittites, Syrians, Persians, Phoenicians, Greeks, Romans, Arabs and Turks all mingling and contributing to the cultural and civilizational melting pot that shone like a beacon for Millennia until recent history. So the tragedy that befell Paris is not only a tragedy for we Europeans, but also for good and decent people around the world; and as this event unfolded and the waves of sympathy swept the world, I wondered where was the sympathy for the rest? Where was the sympathy for the dozens of innocent Lebanese who lost their lives in public places going about their own business in a mass explosion? Where was the sympathy for the hundreds innocent airline passengers whose lives were snuffed out over the Sinai when a Russian airliner was blown out of the sky? Where was the sympathy for the other public atrocities in Egypt, Iraq, and Pakistan? 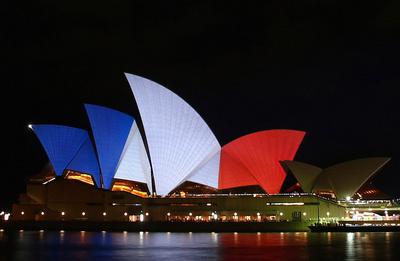 With great embarrassment did I observed friends and acquaintances on Facebook - just like others around the world - change their Facebook cover page photos covered with a French flag like sheep because it is the fad on social media rather than a true expression of sympathy. Where are the Lebanese flags on Facebook? Or the Russian flags? Or the Iraqi and the Syrian flags? The answer is in the subjective empathy expressed be people rooted in relativism and particularism. Where people will express true grief and sympathy for their fellow human beings only when they have invested emotionally and intellectually into a people, a place, a particular culture; only when they become relative and particular to them. A philosopher and friend of mine said to me recently that the reason adults around the world have reacted the way they have is because Paris is a sort of ‘Disneyland’ far adults. It shines and glitters with all the shiny baubles; romance, culture, architecture, history and the collective sighs and kisses of the lovers, artists and writers who have ever entered this enchanting city; for Paris is the emerald city of OZ of our western imagination. The predictable knee jerk reaction in the west to this atrocity would be to blame this on Islam, of a civilizational battle between the west and the east and if this were invested with any belief and actuality from either side, then this would become the kiss of death for both sides. The real battle here is between the collective good and decent moderate people’s right around the world from all races and religions against the violent and radical religious and philosophical extremism on the other hand, and to not embrace this narrative is to reject and exclude decent and moderate Moslem people right around the world to our great loss. For we Europeans have to remind ourselves here of our battles with radical extremism in the twentieth century in the form of the dark shadows of fascism which brought the world to war and caused the deaths of tens of millions of people; and a battle which we still fight to contain this dark shadow. Yet now, it is the Moslem world's turn to fight its own battles against the forces of religious extremism within it; and here, we Europeans would be hypocritical and without morals if we did not extend the hand of friendship to help our Moslem friends in their own battle of the self. The other victim here besides Europeans and moderate Moslems around the world? The innocent rivers of refugees pouring into Europe to escape the same extremism that we Europeans have just been subjected to on Friday night. Then on that question, what next? What of the security of Europeans vis-a-vis the Schengen agreement? As noble as the ideal of free movement of peoples across Europe is, this utopian ideal has run smack against the brick wall of the practicality and reality on the ground. Where nations have the right to seek the safety and security of their people, to secure their borders and to have a say in who and what comes enters across its borders. France has closed its borders and many others are following suit and in effect the Schengen Agreement as we know it is dead; but what is required now is not the total abolition of the agreement, but a compromise where the practical concerns of security are balanced with the principle of the free movement of people to honour the spirit of the Schengen Agreement. Where in this tragedy in Paris, the other question has to be asked is how were the automatic weaponry smuggled across Europe to Paris and Belgium? How Europe responds now is crucial, and off course the dogs of was shall be loosened slightly as is expected of France and its allies to strike ISIS in its heartland in Syria in a conventional military response. But here Europe has to be careful not to turn this into a battle of west versus east which is a narrative that ISIS hopes will occur. However, the correct response here is for Europe and the west to stretch their hands out to the decent and moderate peoples of the Moslem world who are trying to live peaceful and productive lives following their own beliefs and culture in a harmonious way just like all the rest of us are trying to do. Where here together with our allies in the moderate Moslem world, we have to not be afraid to name the enemy. For to fight the enemy one has to name them, and here we are not talking about a people or nations, but an ideology which when expressed through the toxic evil of the dark shadow that lurks within the subconscious in all men and women is the most harmful of all. Where we have at present the toxic radical extremist belief of Wahhabis Islam, which is a puritanical form of Islam that takes the ethical content out of the beauty of Islam like that offered by Sufism; and also political Islam that seeks to impose itself on non-believers. Both these concepts are philosophies of dehumanisation that denies any moral and ethical value, equality and legitimacy to non-Islamic nations around the world. Thereby making possible the radicalisation of aimless and disaffected Moslem youth, where these ideologies of extremism have to identified, isolated and tackled. Where the engagement of the Islamic communities to challenge these radical ideas of Islam is crucial and to enable a counter-narrative available thereby making these noxious ideologies both irrelevant and obsolete. Where further, a challenge to Wahhabis Islam at its roots in Saudi Arabia is required, yet here we have the grubby petro-dollars crossing palms on the various market places around the world muffling any critiques of the source of this poison. We Europeans have nearly brought the world to the doors of Armageddon in the twentieth century with our own brand of radical extremist ideology of fascism, where here we are still struggling to keep the lid tight on the bottle lest this dark genie escapes. At the moment, our moderate Moslem friends around the world are struggling with their own battle against their own newly born dark shadows of radical extremism, and don't we Europeans here owe it to our Moslem friends to help them now fight their battle as allies rather than as enemies? The famous psychologist Carl Jung once said; "One does not become enlightened by imagining figures of light, but by making the dark conscious", now is time that humanity unites together to make the dark conscious and dissipate it for good. Brilliant article - evokes the decorative wonder of Paris and contrasts it with the poignantly confronting nature of the Shadow. Indeed Nikos, what you write is prophetic but from the anemic responses to insightful articles analyzing the Paris outrage which have appeared in Ovi recently, one wonders if anybody is listening and reflecting, or are they too preoccupied with selective grief and shifting the blame and the guilt? Jung, who is no doubt one of our modern gurus, taught us how to confront our shadow by acknowledging the symbiotic relationship between light and darkness, so that we don’t make the enormous mistake of blaming one and a half billion Moslems and their religious beliefs (considered obscurantist and Medieval and unprogressive) every time a few non-representatives Muslim fanatics and extrimists commit outrages and crimes against innocent people in the West, 99% of which are not done in the name of religion in any case. You have it on target: to confront our 20th century shadows means to refuse to “project” our own guilt on the other, as Jung also well taught us; in effect, to acknowledge that the Enlightenment has still to enlighten itself, for the injunction “know thyself” applies to nations and whole civilizations as well as to individuals.